Momoiro Clover Z is Japan's Girls Idol Unit formed since 2008. One person graduated in 2018, and now four people are active. 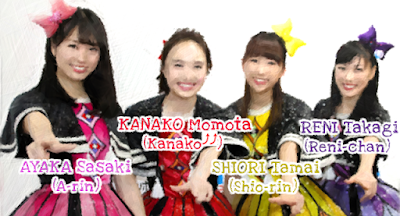 It is commonly abbreviated as MCZ or Momoclo (Momokuro). They are color-coded like 'Power Rangers' or 'Super Sentai'. Team leader is KANAKO(red), the other members are RENI(purple), SHIORI(yellow) and AYAKA(pink). We would like to introduce their charming personality from now on in this website. However, if you want to know more information soon, we suggest you read Wikipedia first. Also, especially if you have any information you would like to know, please let us know via contact form. We will answer as much as we can. Today's school lunch was ’Momoclo lunch'.